Dell has lifted the lid on several unconventionally-sized 4K monitors that pack in four times the number of pixels than a standard HD panel. In terms of size, the 30-inch monitor has long been recognized as the largest panel most PC users with big desks would be prepared to go for. At 31.5 inches, Dell's new UltraSharp 32 HD display goes one step beyond and is knocking on the door of living room-sized dimensions. 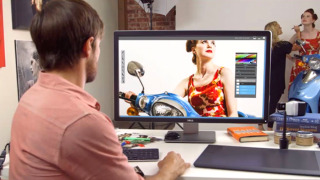 It's Dell's largest monitor to date, managing to cram in a quad-HD pixel resolution of 3,840 x 2,160. As such, the company is pitching it at graphics designers, video and game developers, CAD/CAM designers, engineers and other professionals (or anyone else) needing ample screen real estate. The monitor also offers 176-degree wide viewing angles and supports the 99 per cent AdobeRGB industry colour standard. It's joined by the Dell 24 UltraSharp HD Monitor, which squeezes its larger cousin's viewing angles and screen resolution into a smaller frame. At the lower end, Dell has outed something of a rarity right now: a 28-inch monitor (again with a 4K resolution). We're well accustomed to 27-inch monitors, and the current crop of 'cinematic' 21:9 panels mean that 29-inch monitors are increasingly commonplace. Dell describes its forthcoming UltraSharp 28 HD panel as the 'industry's most affordable Ultra HD monitor', coming in at 'under $1,000' (around £611, or AU$668). The final cost is yet to be confirmed, but we wouldn't be surprised to find it hit the shops at a dollar less, which is sure to turn heads considering the eye-watering price of 4K panels to date. Its features include a pivot to swing the monitor round into portrait mode and several connectivity ports to hook up external devices. We've contacted Dell to shed more light on what this curiously affordable 4K PC monitor has to offer. Dell's UltraSharp 32 is available now starting $3,499 (£2,379 / around AU$2,334). The smaller UltraSharp 24 Ultra HD will be outed globally on December 16, starting at $1,399 (£1,059 / around AU$1,536), and the UltraSharp 28 Ultra HD will hit the shelves in 'early 2014', according to Dell.